Another week, another puppet finished – in a little over a week Late Night Puppets will be opening in Wellington, part of the 2018 Fringe Festival. 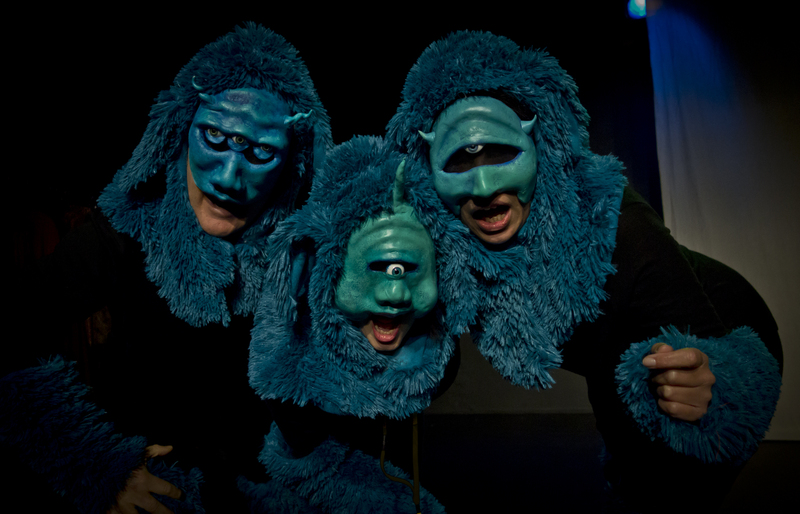 It’s a playful improvised show, with as the title suggests, a few puppets in it, as well as a bunch of human friends. Most of the puppets found me through ebay, but a few, five or six if I keep sewing, will be puppets I’ve made. Here’s Cinnamon or Caramel or Ginger (he/she goes by various names), whose arms were stitched on just in time for today’s training session. The eyes are from a $1 toy found in a charity shop, with added doll eyes replacing the original black spots. I felt vaguely guilty about cutting up a creature just for the eyes, so also reused the fabric horns, and made a blue and pink tongue out of one of the original legs. It’s been much too long since I made any masks. And I’ve never made a classic latex mask using a plaster mould. My masks have all been one-off creations in instamorph, baring some very early efforts with papier mâché. I’ve always thought I should know how to work in the basic method that so many other mask-makers use. Soo, this week, I’m taking advantage of a short course at a nearby university, run by a properly famous creature creator, Jordu Schell. Today was Day Three, when we all finished our sculptures, covered them in casting plaster, and then cleaned our moulds of clay. It was a pleasant novelty to take a sculpt to a really finished texture, fully creating a character in clay. This is not my usual mask-making process, when detail is added directly on the mask’s plastic surface. The clay we used, WED clay is also new to me. It’s not made to be fired, and is smooth and firm and very slow drying. I even made some new tools last night to help me create the scales on my glum reptile’s skin, inspired by a cunning tiny loop that another student made with old guitar string and a chopstick. Mine used ukulele string, clay wire, and Instamorph handles. I should have done more research on reptile skin techniques before beginning to hand-draw scales, as I was slightly cross eyed by the end. But I’m pretty happy with where I got to. Tomorrow when the moulds are dry it will be time to pour the latex, while Friday will be the fun of finishing and painting. I am taking many notes, which I hope will still make sense when I eventually try to follow them. The improvised Fringe show I’m a player in this year is Attack of the Killer B-Movie. Naturally a chance to use some ol’ favourite monster masks in the promotion and flyering! Should you be in Wellington some evening between Tue 16 Feb and Fri 19 Feb 2016, I can promise this show will be a fun way to spend an hour.